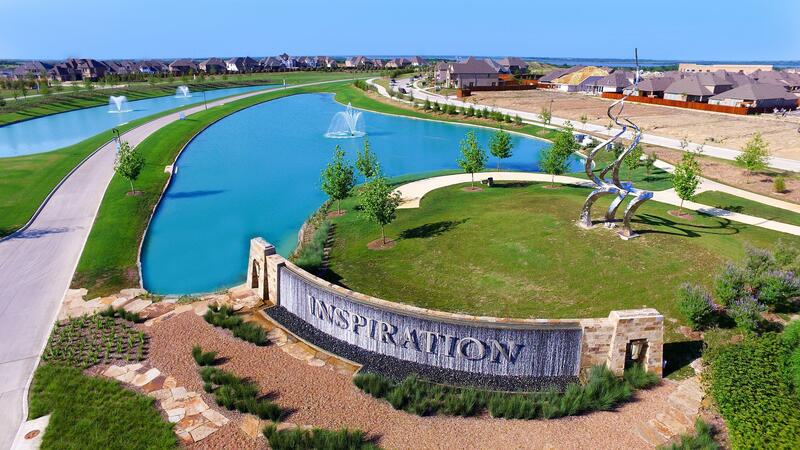 Scenic views of Lake Lavon and rolling hills surround the splendid 593-acre master-planned community of Inspiration. Even the amenities are inspired, with community pools and playgrounds, sport fields, open green spaces and plenty of nearby water activities. You'll be able to relax pool-side at the future upscale master community center, featuring resort-style pools and cabanas overlooking Lake Lavon. The future community center will include a playground, tennis courts, fitness center, walking & running trails, an outdoor pavilion, and an entertainment courtyard. Life in Inspiration is a get-away from the fast-paced city life of Dallas-Fort Worth. Convenient access to Central Expressway (US Highway 75) and the George Bush Turnpike connects you to a wide variety of shopping, dining, entertainment venues and employment centers in Wylie, Plano, Richardson, Dallas, Allen and McKinney. Whether you are coming to the area from out of state or just looking to get away from the city, Inspiration provides serene, relaxed living in your new home. Students living in Inspiration attend the highly acclaimed Wylie Independent School District and Wylie's newest elementary school, George W. Bush Elementary, is located within the community.